What E-Book Formats Does iPad Support? The iPad is a terrific reading device because it supports a wide range of popular e-book and audiobook formats. Sure, it's great for movies and games and the internet, too, but for book lovers, the iPad's versatility as a mobile library is its chief appeal. Apple's tablet comes with the company's iBooks app preinstalled. The app works seamlessly with the company's iBooks Store, but the iPad also supports many other types of digital book formats. You only need to download the appropriate app. The books purchased through the iBooks Store are in the ePub format, but they are modified to include Digital Rights Management to prevent unauthorized sharing or copying. 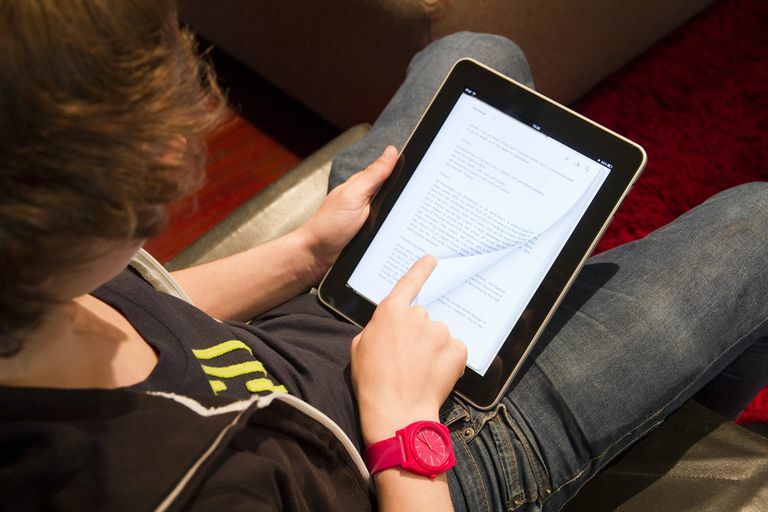 Any ePub digital book can be opened in the iBooks app or in other downloadable apps. The ePub open format is one of the most commonly used e-book file types. Apps like iBooks and Nook can read ePub files purchased from their respective online stores or downloaded from the web. There are a number of programs for Mac and Windows that convert other kinds of e-books to ePub format. Barnes & Noble sells e-books on its website and through its Nook app. Access these books using the free Nook app available at the iPad App Store. Nook e-books are a renamed version of the common ePub file type. Amazon's Kindle isn't just an e-reader that competes with the iPad, it's also an app for the iPad. You can read Kindle books on the iPad using the Amazon Kindle app. Kindle e-books are a modified version of the Mobipocket file format and use the .AZW file extension. PDF is the probably the most popular downloadable document format on the web, so you're sure to find e-books in this format in a lot of places. There are tons of PDF-compatible apps for the iPad, including Adobe Acrobat Reader, GoodReader, and iBooks. CBR and CBZ formats are related types of digital book formats that are used to present comic books and graphic novels. To read them on the iPad, you need an app such as the free Manga Storm CBR app or the paid app Comic Zeal. Amazon's comiXology is the leading online comics and graphic novel store. You buy comics on the website and then use the comiXology app on your iPad to download and read your purchased comics, which come in file types that include PDF, CBZ, and the company's proprietary CMX-HD format. Kindle Format 8 is the next-generation version of the Kindle e-book file. It adds support for HTML and CSS to the existing Kindle format and uses the .AZW3 extension. The Kindle app on the iPad supports the KF8 format. Microsoft Word creates .doc files. Some e-books, usually those sold as direct downloads by self-publishers, come in this format. While there are a number of iPad apps that can read DOC files, Microsoft Word for iPad is free. Amazon's use of a modified version of Mobi for the Kindle makes this file format one of the most widely used for e-books. Outside of the Kindle, though, you likely won't encounter it too often. The best way to read Mobi files on your iPad, which does not support the Mobi format, is to use a program like Calibre E-Book Management Software to convert the Mobi files to ePub format. Then you can read them in iBooks or another ePub compatible reader app. Plain text files, which have the .TXT file extension, pop up from time to time, especially on sites that offer free, public domain books, such as Project Gutenberg. A large number of apps support plain text files, including the paid app GoodReader, and iBooks. Audible - Audible.com uses its proprietary formats (.AAaa, .AAX, and .AAX+) and is probably the most popular and widely used audiobook service on the internet. With the free Audible.com app for the iPad, you can enjoy any book from that site on your tablet. MP3 - Other audiobooks are often delivered as standard MP3 audio files. Since that's the same format as many music files, you can download an MP3 and then sync it to your iPad to listen to it using the built-in Music app. Does the iPad Support Bluetooth?